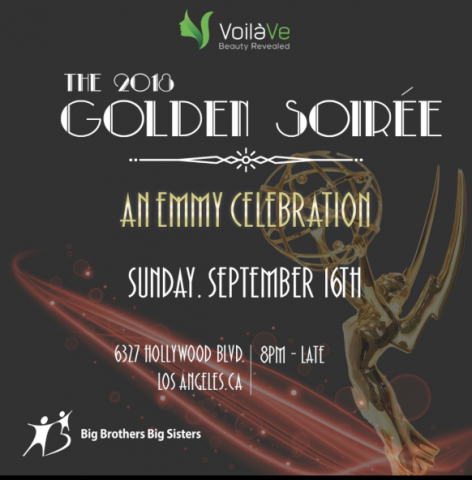 VoilaVe Skincare Products is the main sponsor of The 2018 Golden Soiree on September 16, an exclusive red carpet after party in Los Angeles, following the Emmy Awards with the benefits going to Big Brothers Big Sisters. VoilaVe will introduce the much anticipated VoilaVe Rose. VoilaVe Skincare Products is proud to be the primary sponsor of The 2018 Golden Soiree on September 16, an exclusive red carpet after party in Los Angeles, following the Emmy Awards with the benefits going to the Big Brothers Big Sisters where VoilaVe will also introduce the much anticipated VoilaVe Rose. VoilaVe, Beauty Revealed, is the World’s Leading Skincare Products Company sourcing the best in organic ingredients from around the globe and manufacturing leading edge natural beauty products in the United States. Leading VoilaVe skincare products include Organic Moroccan Argan Oil, Triple Action Vitamin C Serum, Eye Gel, and Face Tightening with Retinol. VoilaVe was excited to take part when invited to be the main sponsor of The 2018 Golden Soiree. The glamorous Emmy Awards After Party was recognized by the company as a tremendous venue to showcase on a large scale VoilaVe’s newest product, VoilaVe Rose which is USDA Organic, Proudly Made in the USA, Not Tested on Animals, and comes with a 100% Satisfaction Guarantee.